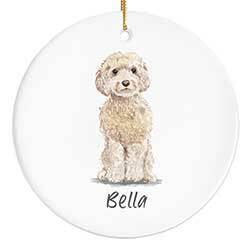 Cat & Dog Christmas Ornaments & Decor - Everything from custom personalized ornaments to dog-themed stockings and decorations, lots of great Christmas decor to honor your beloved pets! 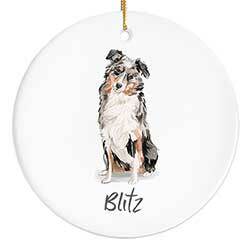 Features a watercolor image of an Australian Shepherd dog, and your choice of name. Great for special pets, or as a pet memorial ornament! 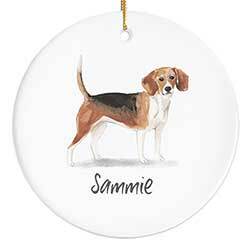 Features a watercolor image of a beagle dog, and your choice of name. Great for special pets, or as a pet memorial ornament! 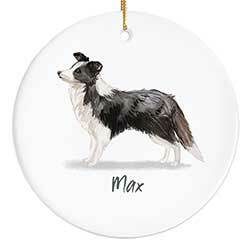 Features a watercolor image of a border collie dog, and your choice of name. Great for special pets, or as a pet memorial ornament! 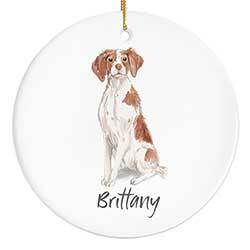 Features a watercolor image of a Brittany spaniel dog, and your choice of name. 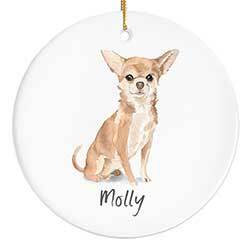 Great for special pets, or as a pet memorial ornament! 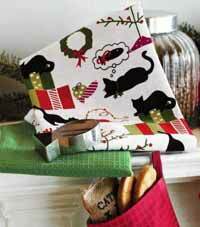 Cat Dishtowel Set with Cookie Cutter, by Tag. Darling set includes a super-absorbent green waffle weave towel, and fish-shaped cookie cutter, and a white cotton towel printed with cats, holiday gifts, and more. Includes a recipe for homemade cat treats. Towels measure 18 x 26 inches. Part of the Meow & Woof Collection. 100% cotton. Other collection items also available! 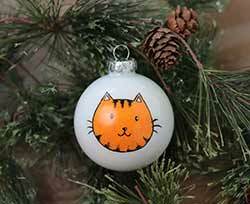 Include your favorite kitty on your holiday tree this year, with this hand painted glass ornament featuring a cat head, in an orange tabby. Comes gift boxed, with free personalization! 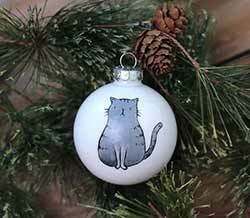 Include your favorite kitty on your holiday tree this year, with this hand painted glass ornament featuring a gray tabby cat. Comes gift boxed, with free personalization! 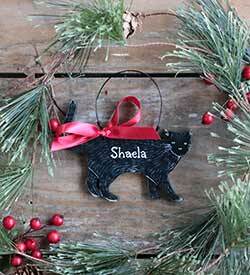 This darling black cat ornament is perfect for commemorate your beloved feline friend, and is custom painted to order. Makes a great stocking stuffer or even a pet bereavement gift! 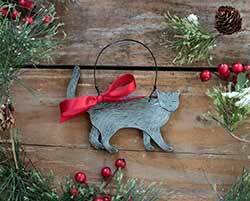 This darling gray cat ornament is perfect for commemorate your beloved feline friend, and is custom painted to order. Makes a great stocking stuffer or even a pet bereavement gift! 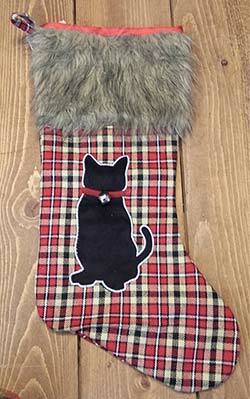 Cat Stocking, by Grasslands Road. Features an appliqued cat silhouette in black with burgundy and silver thread, with a jingle bell sewn a the kitty's neck. Main body of stocking is a woven plaid in red, light tan, and black. Cuff is a faux fur, inside lining is red satin. Part of the Deck the Halls Collection. Measures approx 19 x 10 inches. Features a watercolor image of a chihuahua, and your choice of name. Great for special pets, or as a pet memorial ornament! Features a watercolor image of a brown cockapoo dog, and your choice of name. Great for special pets, or as a pet memorial ornament! Features a watercolor image of a champagne cockapoo dog, and your choice of name. Great for special pets, or as a pet memorial ornament! Features a watercolor image of a black cocker spaniel dog, and your choice of name. Great for special pets, or as a pet memorial ornament! Features a watercolor image of a brown cocker spaniel dog, and your choice of name. Great for special pets, or as a pet memorial ornament! 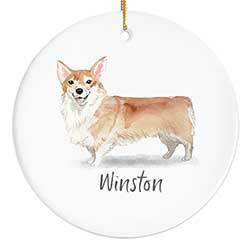 Features a watercolor image of a corgi dog, and your choice of name. 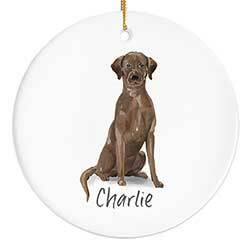 Great for special pets, or as a pet memorial ornament! A unique gift for the dog lover, the perfect accent for an eclectic Christmas tree, or a fun stocking stuffer! 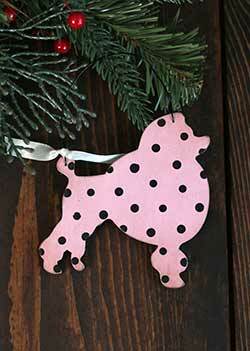 A a unique gift for the dog lover, the perfect accent for an eclectic Christmas tree, or a fun stocking stuffer! 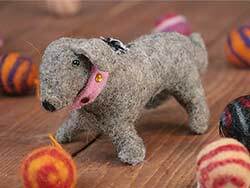 Dachshund Felt Ornament, by Cody Foster. Stitched of wool with a pink beaded collar. Measures 6 x 3.25 inches. Formerly Backporch Friends American Folk Art, Cody Foster's line of seasonal decor is beautiful and unique, many modeled after vintage/retro designs. 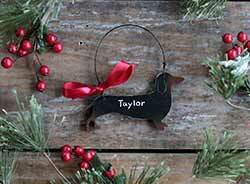 Features a watercolor image of a black dachshund "wiener" dog, and your choice of name. 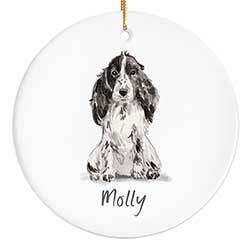 Great for special pets, or as a pet memorial ornament! 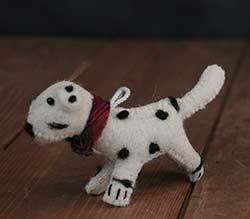 Dalmatian Felt Ornament, by Cody Foster. Stitched of wool with needle-felted details. Measures 5 x 3 inches. Formerly Backporch Friends American Folk Art, Cody Foster's line of seasonal decor is beautiful and unique, many modeled after vintage/retro designs. Hand-painted turned wood dolls, great for cake toppers, holiday decor, ornaments, or imaginative play! This is painted as a black and white dalmatian dog! 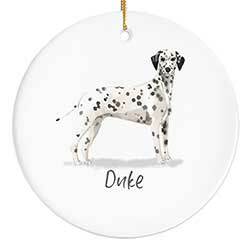 Features a watercolor image of a black and white spotted dalmatian, and your choice of name. 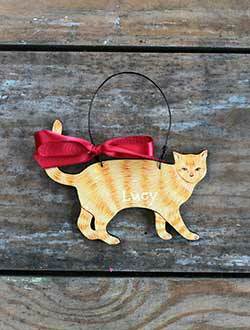 Great for special pets, or as a pet memorial ornament! Don't forget Fido on your tree this year! 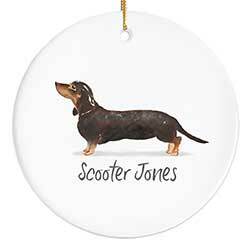 This darling Dog bone ornament is a unique gift for the dog lover, the perfect accent for an eclectic Christmas tree, or a fun stocking stuffer! Dog Dishtowel Set with Cookie Cutter, by Tag. Darling set includes a super-absorbant red waffle weave towel, and bone-shaped cookie cutter, and a white cotton towel printed with dogs, holiday gifts, and more. Includes a recipe for homemade dog treats. Towels measure 18 x 26 inches. Part of the Meow & Woof Collection. 100% cotton. Other collection items also available! 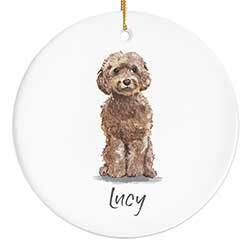 Dog Ornament, by Blossom Bucket. 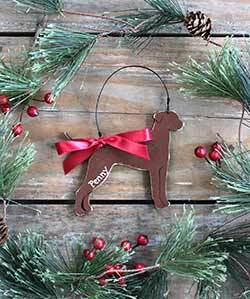 These sweet flat-backed resin dog ornament is a special pet-lover's accent! 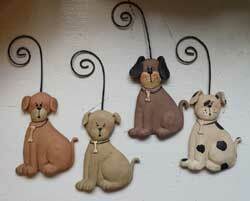 Sold individually - Choose (from left to right) the Brown, Beige, Dark Brown, or Spotted Dog Ornament. A Suzi Skoglund design. Measures 4.75 x 2 inches. 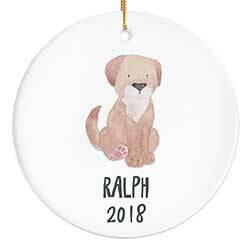 This dog ornament is the perfect gift to honor man's best friend, specifically the Labrador! Available in chocolate, black, yellow, and white, this ornament is custom painted to order, and comes boxed ready for gift giving! Features a watercolor image of a chocolate Labrador, and your choice of name. Great for special pets, or as a pet memorial ornament! 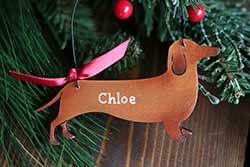 Include your favorite dog or cat on your Christmas tree with the custom wood slice ornament, or use as a pet memorial! 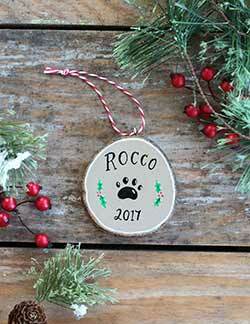 Accented with a small paw print, and your chosen name and year. Pretty pink with whimsical black polka dots, this poodle ornament is the perfect gift for a paris lover, sweet 16 girl, or proud pet owner! 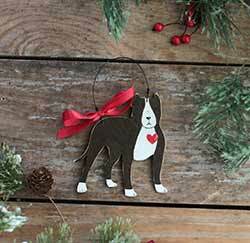 Show your love for a special dog breed with this Pit Bull ornament! Perfect to honor that special pooch. 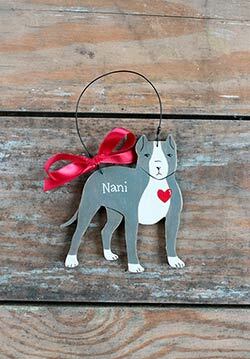 Show your love for a special dog breed with this gray Pit Bull ornament! Perfect to honor that special pooch. Features a watercolor image of a puppy dog, and your choice of name. Great for special pets, or as a pet memorial ornament! 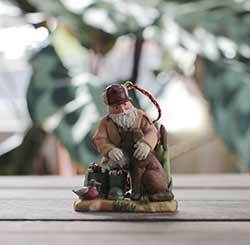 Great for an outdoor enthusiest or outdoor themed tree, this ornament santa dressed in outdoor gear, with his pack full of gifts. Accented with cattails,a duck decoy, and pet Lab! 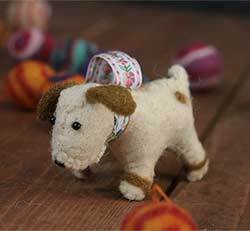 Terrier Felt Ornament, by Cody Foster. Stitched of wool with needle-felted details. Measures 4.5 x 3.5 inches. Formerly Backporch Friends American Folk Art, Cody Foster's line of seasonal decor is beautiful and unique, many modeled after vintage/retro designs. Include the family pet in the holiday celebrations this year with the bone-shaped Tristan Dog Stocking. Hand-painted turned wood dolls, great for cake toppers, holiday decor, ornaments, or imaginative play! 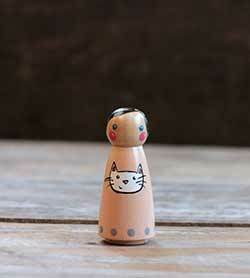 This sweet Kitty Cat Girl wears a peach colored dress with a border of grey polka dots, and is accented with a white kitty face.